During a break between school sessions in the spring of 1835, Princeton University physics professor and future Smithsonian Secretary Joseph Henry traveled to Philadelphia for a meeting of the American Philosophical Society. While there, he witnessed pioneer American balloonist John Wise's dramatic first ascent. Wise was able to rise high enough only after throwing his coat, hat, and shoes overboard. He later landed successfully in New Jersey. Two years later, on a visit to London, Henry wrote of a similar event—a man's attempt to parachute to the ground after being lifted five thousand feet. The parachute collapsed and the man was killed. Henry was quick to remark on the danger of balloon and parachute experiments at a time when the science of aeronautics was in its infancy, but he recognized the value of balloons. A year after being elected the Smithsonian's first Secretary in 1846, Henry received a letter from John Wise offering to provide meteorological observations made during balloon ascents. In 1854, Henry published an article by Robert Hare based on Wise's findings in the Smithsonian's annual report. He later pointed to Wise's observations in discussing a class of winds now known as the jet stream for his 1858 installment of a series on meteorology1 for the Patent Office's annual reports. In the spring of 1859, Wise launched a balloon named the Smithsonian carrying equipment provided by Henry. Although Henry was skeptical of Wise's theory that "a sufficient quantity of [atmospheric] electricity for practical purposes could be obtained" and delivered to earth via a wire suspended from a balloon, he outfitted the balloon with "gas, conductors, ropes and meteorological instruments." Wise's Smithsonian made only one ascent, but Henry continued to consider the role balloons might play in observing atmospheric phenomena over a decade later. An 1872 entry in Henry's desk diary, refers to his suggestion of "the invention of a light apparatus for recording the height of the barometer in balloon voyages." In 1873, the owners of a newspaper, the New York Daily Graphic, wrote to Joseph Henry to ask his opinion of John Wise's proposal to traverse the Atlantic via balloon. The newspaper proprietors were considering funding the voyage. Henry advised Wise that until the balloon could be guaranteed to stay aloft for a minimum of ten days, he should not pursue such a potentially dangerous venture. "While I would be delighted to learn that you had successfully accomplished the feat, I would prefer that some one in whom I am less interested were subjected to the risk," Henry concluded. Wise replied that he was determined to attempt the voyage, but his balloon later ruptured during an inflation, and he did not pursue the transatlantic crossing. Henry suggested that John Wise make a preliminary transcontinental flight from the Pacific to the Atlantic coasts before he attempted to cross the ocean. This was the same advice he had provided to balloonist Thaddeus S. C. Lowe in 1861. Lowe did not attempt the transatlantic journey, opting instead to make a less ambitious overland flight after receiving advice from Henry in person. Lowe later called this meeting "one of the highlights of my life," and soon contacted Henry again to request financial support for more ascents. The Smithsonian Board of Regents voted against funding Lowe, in part because the Civil War had already begun to strain the Institution's finances, but Henry suggested Lowe's balloon might "be of advantage to the Government in assisting their reconnaissance of the district of country around Washington." Lowe was already pursuing this, but he later credited Henry's "repeated interviews" with President Abraham Lincoln, Secretary of War Simon Cameron, and topographical engineers for enabling him to demonstrate his balloon in Washington. In June 1861, Henry reported to the Secretary of War Cameron on the success of Lowe's recent experiments. During a number of ascents from the grounds of the Columbian Armory (a site now occupied by the National Air and Space Museum), the Smithsonian Institution Building, and the White House, Lowe had successfully telegraphed messages to a ground station. After Lowe made several more ascents, including one near Falls Church, Virginia, resulting in a relatively accurate aerial map that impressed military officials, Henry wrote another letter urging the Union Army to hire Lowe. 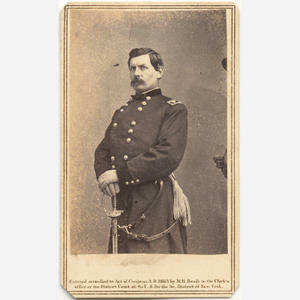 By the fall of 1861, Lowe was authorized to organize a balloon corps within the Union Army.2 Unfortunately, Lowe was hindered by his lack of military rank and was only minimally compensated for his services. In an 1863 letter to Secretary of War Edwin M. Stanton seeking retroactive payment for Lowe, Henry noted Lowe's balloon was "sent over to the first Battle of Bull Run and was afterwards used in various reconnaisances [sic]." However, Lowe had resigned in May of that year and the Balloon Corps had since ceased functioning. 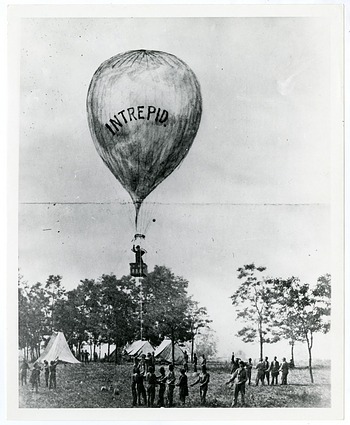 In October 1861, Henry lent his support to aeronaut William H. Helme of Rhode Island, who proposed inflating balloons with hot air instead of gas. "It is well known that a large amount of time, expensive materials, and bulky apparatus are required to inflate an ordinary balloon—at a distance from City gas works," wrote Henry to General George B. McClellan. With McClellan's approval, Helme conducted tests in November and December using alcohol for fuel. As a member of a board assigned to evaluate and report on hundreds of proposals sent to the Navy during the Civil War, Henry had the opportunity to meet with the inventor of an "aerial ship" in 1864. While the committee was impressed with the inventor's model—an early form of the dirigible, or blimp—he was not able to provide them with a prototype or what they considered sufficient evidence for recommending a large government appropriation. Henry was often consulted about inventions and ideas he found ridiculous, including at least two balloon-related proposals. "To day I have been occupied for two hours," he wrote in December 1865, "in hearing an exposition of a new project for suspending telegraphic cables at the end of which time I was obliged in candor to tell the inventor . . . that I thought he might claim the merit of originality because no two persons could possibly hit on such a chimerical scheme. 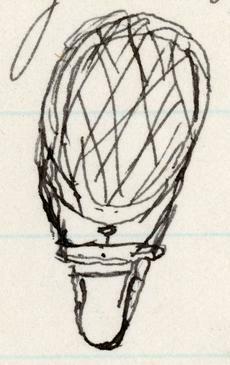 The proposition was to support the cable in mid air over the ocean by means of a series of captive balloons." The inventor claimed he was able to keep the balloons aloft for five days, which Henry found "improbable. "3 In 1873, Henry was visited by someone who proposed that by shaping a balloon "in the form of a double convexe [sic] concave vessel that it would obey the helm and move in an opposite direction to that of the wind. I endeavored to convince him that this was not the case and that a vessel immersed entirely in a fluid would move with that fluid what ever might be the shape of the vessel." 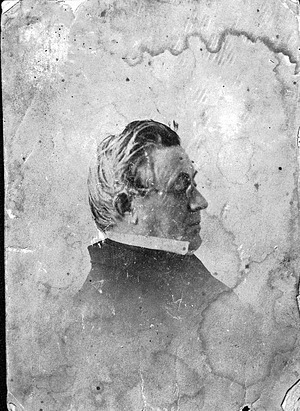 Ballooning was among the many applied sciences with which Joseph Henry became involved in his role as the nation's de facto chief scientific officer. Henry recognized the ability of balloons to collect meteorological data that could not otherwise be observed, and promoted their use. As a physicist, he was also interested in the mechanics of ballooning; amateur balloonists and inventors found him an enthusiastic advisor. Henry's evaluation and endorsement of pursuits in ballooning during his thirty-one years as the Smithsonian's first Secretary paved the way for later advancements in aeronautics. Kathleen W. Dorman, "Interruptions and Embarrasments': The Smithsonian Institution during the Civil War," Smithsonian Institution Archives. "Thaddeus Lowe & Civil War Ballooning," National Air and Space Museum. Pamela M. Henson, "Civil War Reconnaissance Takes Flight," The Bigger Picture (blog), Smithsonian Institution Archives, June 18, 2011.